Andrew is an Executive working in our Due Diligence team. 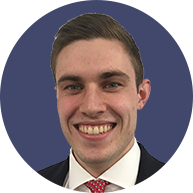 Andrew graduated from Lancaster University in 2016 with a BSc in Accounting, Audit and Finance, including a placement year in EY’s Bristol office in the audit practice. Following graduation Andrew joined EY in their London office, working towards his CA qualification. Andrew qualified as a Chartered Accountant with ICAS in 2018, working as an Executive in EY’s oil and gas department until joining HMT in January 2019. Since joining, Andrew has worked on several due diligence assignments including Octopus’ investment in Rotolight. Andrew is a keen Scottish rugby follower and he also enjoys a round of golf and watching the cricket in the summer. Outside of sports, Andrew likes spending time with friends and sitting on the beach in the sunshine somewhere far away from the UK. But unfortunately he doesn’t do the above as often as he would like to!